With the recent publication of the Housing White Paper, the Budget was slim on changes to housing policy. That said, Phillip Hammond’s first – and last – Spring Budget contained significant new commitments including £2bn for social care over the next three years, changes in National Insurance Contributions for the self-employed, and new initiatives on education and skills. Read the NHC’s full on-the-day briefing here. The Chancellor’s announcement that Government will press ahead with recommendations made by Lord Sainsbury on T Levels represents a huge change in government policy on education and skills. This, combined with the Government’s drive to increase apprenticeships, represents a new and growing focus. One of the biggest takeaways from the Budget is that the Government are prioritising White and Green Papers on issues including social care, consumer rights and tax simplification. This would suggest a blockbuster Autumn Budget 2017 for which, naturally, the NHC will be preparing an on-the-day briefing. Today sees the release of the Northern Housing Consortium’s Impact of Universal Credit Round 3 report. This is the third in a series of four reports and builds upon the results of the first two, covering the period March-July (all three of which can be accessed from the NHC’s website here). The research investigates how the implementation and continuing rollout of Universal Credit is affecting housing organisations in the north. More than one-fifth of respondents said that tenants had terminated their own tenancy as a direct as a direct result of UC. Almost all of the responding organisations are having to step in and assist tenants with the cost of living. Half of organisations have introduced credit reference checks to prospective tenants as a result of UC implementation – double the figure in Round 2. There is a move to debiting tenants’ rent accounts in arrears as 90.6% of those that debit accounts in advance have experienced problems. We continue to use findings from the research to engage with the Department of Work and Pensions officials through NHC’s roundtable programme to raise members’ concerns and experiences of procedural issues and we will work with DWP to make the new system as smooth as possible. The final round of the survey will be announced in the NHC eZine but there is also a dedicated contact list for anyone interested in taking part in the project. To ensure you are able to participate, please contact Business Intelligence Officer Barry Turnbull at barry.turnbull@northern-consortium.org.uk. Read the NHC’s full on-the-day White Paper briefing here. The White Paper acknowledges the scale of the housing crisis facing the country and recognises the fact that governments of all persuasions have not been able to sufficiently ramp up house building to meet with the backlog of under supply and projected future need. The Government’s White Paper aims to change this but the discussions in advance were focused on whether the proposals set out today are the catalyst needed or is the housing industry the proverbial slow turning oil tanker? The White Paper sets out a series of recommendations addressing common approaches to planning for housing need, barriers in the planning process, support for Local Authorities in speeding up delivery of new homes, and the need to bring new entrants to the market place. Underneath the headlines there is a significant amount of detailed policy proposals that the Northern Housing Consortium welcomes. The White Paper also rebalances policy focus away from home ownership and acknowledges the need to ensure the rental market is operating efficiently providing good quality secure accommodation for those who choose to rent. The NHC is pleased that we have this Housing White Paper. It is a mature acknowledgement of the benefits that a shared approach to policy development can bring. We will work with the Government and our members to support this White Paper and work collaboratively to help refine and improve where we believe policy initiatives need further consideration. The NHC has worked with members and sector experts to deliver the Commission for Housing in the North and we are pleased that the White Paper reinforces messages from the Commission such as consideration of wider tenure issues, the need to ensure quality across the rental sector, and capacity support for local authorities to ensure the right housing is delivered in the right place. The White Paper is not unsurprisingly light on issues around regeneration but we call upon the Government to ensure the Northern Powerhouse Strategy – released alongside the Autumn Statement – picks up this mantle to ensure that housing and regeneration are recognised as tools to support the economic renaissance of the North. The Northern Housing Consortium has today released its ‘Impact of Universal Credit, Round 2’ report. The second in a series of four (read here), this report builds on the results of the first report published in July (read here). The research investigates how the implementation and continuing rollout of Universal Credit is affecting housing organisations in the north. The NHC will continue to use its findings to engage with the Department for Work and Pensions (DWP) officials through the NHC’s roundtable programme to raise members’ concerns and experiences. The NHC will work with DWP to make the new system as smooth as possible for tenants, housing providers and DWP alike. Future rounds of the survey will be announced in the NHC eZine but there is also a dedicated contact list for anyone interested in taking part in the project. To ensure you are able to participate in future rounds, please contact Barry Turnbull, Policy Services Officer at barry.turnbull@northern-consortium.org.uk. In mid-September Office of National Statistics (ONS) published estimates of employment, unemployment, economic inactivity and other employment-related statistics for the UK. It shows that nationally, between February to April 2016 and May to July 2016, the number of people in work increased. The number of unemployed people and the number of people not working and not seeking or available to work (economically inactive) fell. There were 31.77 million people in work, 559,000 more than for a year earlier. The employment rate (the proportion of people aged from 16 to 64 who were in work) was 74.5%. In the North, there were 7.12 million people in employment, 147,000 more than twelve months previous. Almost half (48%) of all employed people in the North were in the North West giving the region a 73% employment rate. Table 1 shows the latest estimates for employment, unemployment and economic inactivity for May to July 2016 and a comparison with the previous quarter (February to April 2016). The above table shows that the unemployment rate estimates are generally showing small changes for each of the regions of the UK. The North East saw the greatest reduction in unemployment of the three northern regions (-1.1%) compared to the same period in 2015, whereas both the North West and Yorkshire and the Humber saw a 0.4% reduction. Notwithstanding this, for the 12 months ending July 2016, the highest unemployment rate in the UK was in the North East (7.5%) compared with 5.1% in the North West and 5.9% in Yorkshire and the Humber. 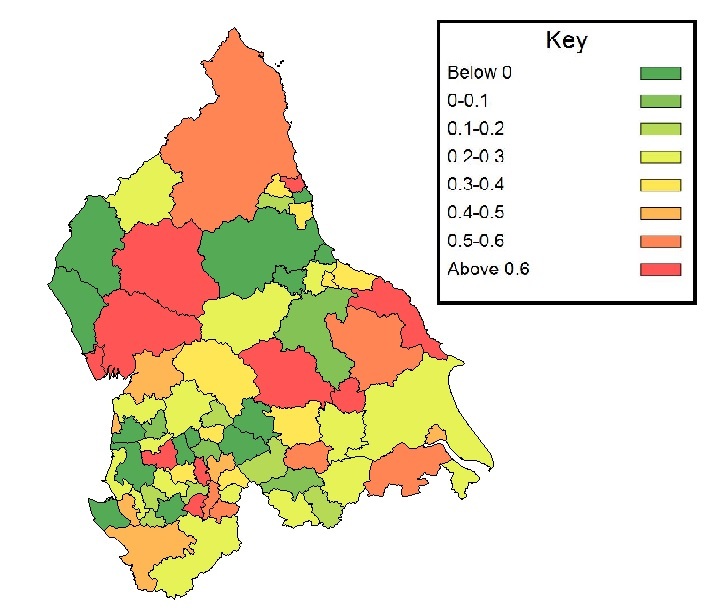 Map 1 shows the percentage of the population of each northern local authority that are in receipt of Jobseeker’s Allowance. The four districts with the highest proportions are in the North East with Middlesbrough (3.7%), South Tyneside (3.4%), Redcar and Cleveland (3.2%) and Hartlepool (3.2%) having a higher proportion that Kingston upon Hull (3.1%). Indeed, all of the Tees Valley authorities have amongst the higher proportions of JSA claimants. Will you be Bidding for the Housing & Technology for People with Learning Disabilities Local Authority Capital Fund? The Department of Health is inviting local authorities working with their local partners, to apply for funds from a capital fund of up to £25m for housing and technology options for people with learning disabilities. The fund will enable more people to live as independently as possible with the best care and support, greatly improving their quality of life. The Government has announced an exemption from the Local Housing Allowance (LHA) cap for those tenants living in hostels and supported housing but is proceeding with the 1% rent cut. In a written statement to Parliament, the Work and Pensions Secretary, Damian Green, said that he would defer the imposition of the LHA cap on supported housing until 2019-20 after which a new system would keep funding at current levels. The announcement follows deep concern from the housing sector, charities and third sector organisations who warned that if the cap were to apply to those living in hostels and supported housing, it would see the schemes providing support to these vulnerable groups become financially nonviable and at risk of closure. One of the chief concerns raised by those organisations working with the homeless and the mentally ill was that the LHA cap would mean widespread closure of many hostels and shelters which could force thousands of people on to the streets. In mid-July, the Government published affordability ratios by every local authority in the country up to 2015. The affordability ratios are calculated using ONS House Prices Statistics (based on Land Registry data) and earnings from the Annual Survey of Hours and Earnings. The earnings relate to the respondents’ place of work rather than place of residence. This means that affordability in commuter areas reflects the earning power of commuters. Ratios were published by lower quartile and median house prices and earnings. 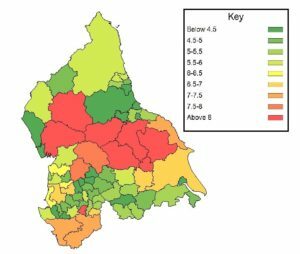 This article will explore lower quartile affordability ratios for local authorities in the North. Since the introduction of the data in 1997, there has been a steady upward trend in the English lower quartile affordability ratio, rising by 3.45 point to 7.02 in 2015 (national and local authority level figures have been revised for 2013 to include revisions made to earnings and house price data) as Figure 1 shows. At the end of 2015, the average lower quartile affordability ratio for the whole of the North stood at 5.58; the most affordable region was the North East where there was a lower quartile affordability ratio of 4.87, followed by the North West (5.50), while Yorkshire and the Humber was least affordable with a ratio of 6.37. It is no surprise, then that the most affordable sub-regions are in the North East. In Durham (3.63) and the Tees Valley (4.61) the North East has the two most affordable places in the North to buy a home. There are also affordable areas in South Yorkshire (5.00) and Merseyside (5.09). The three most expensive sub-regions are dotted across the three northern regions. Residents of North Yorkshire (8.41), Cheshire (6.15) and Northumberland (5.98) require a larger slice of their income to be able to buy a home. As Map 1 below shows, there are areas across the north with more affordable local authority areas – those with ratios of 4.5 or below but there is, along with Trafford, one large swathe of less affordable local authorities with ratios of over 8, stretching from southern Cumbria into North Yorkshire. The least affordable local authority in the north is Harrogate with a lower quartile ratio of 10.04, while South Lakeland (9.14) also has a ratio well above the northern average. The current picture in the north is a result of year-on-year increases since the revisions in 2013. 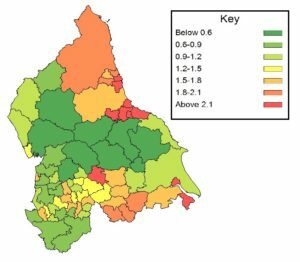 In those two years there was a 0.26 point increase on average across the three regions. Both the North West (0.31) and Yorkshire and the Humber (0.36) saw increases higher than the northern average while in the North East the increase was significantly lower than the average (0.12). Indeed, both Durham (-0.13) and Tees Valley (-0.06) in the North East were the only sub-regions were there was a fall in affordability ratios and housing became more affordable. Conversely, Cumbria (0.61), North Yorkshire (0.54) and Northumberland (0.53) saw the greatest increases in affordability ratios. Map 2 shows the change in affordability ratios by local authority. It shows, as in Map 1, south Cumbria features prominently. However, unlike Map 1, the authorities where affordability ratios have grown the most are pepper potted across the north. Again places like Eden and Harrogate feature with increases of 1.80 and 1.01 since 2013 respectively but also Barrow-in-Furness (1.07) and Scarborough (0.96) have seen significant increases over this period. By interrogating the source data for the affordability ratios, an explanation for the differing changes in the ratios may be gained. The relatively small change in the affordability ratio in the North East can be explained by both lower quartile house prices (6.2%) and lower quartile annual income (6.3%) increasing at a very similar level between the two years. In comparison, lower quartile house prices in both the North West (7.3%) and Yorkshire and the Humber (7.7%) increased significantly quicker than lower quartile earnings in these regions (2.9% and 2.5% respectively). However, reasons for increasing affordability ratios may alter between geographies. Amongst the local authorities that are noticeable for the increase in their ratio include Barrow-in-Furness. Here, lower quartile earnings grew by 1.4% compared to an increase in lower quartile house prices of 8.7%. Elsewhere, while the 0.53 point increase in Northumberland can be partly explained by a 10.8% increase in house prices, this in coupled with a 4.3% fall in lower quartile earnings.